The Range Rover Evoque has suddenly lost a third of its volume in Q3, after gaining 11% in the first half. The Evoque will be facelifted slightly, without much changes to its exterior design, and the addition of a convertible won’t make much of an impact sales-wise, as our readers agreed in the poll. Another reason for the Evoque slowdown could be cannibalization from the Land Rover Discovery Sport, although that model still hasn’t found traction in the way that I had expected from it, especially considering it’s the only model in the segment that offers a 7-seater option. For now, it doesn’t threaten the BMW in its fourth place of the segment, and instead the Porsche Macan even outsold the Discovery Sport in Q3. The Macan leapfrogged the BMW X4 for sixth place of the segment, but the gap to the Land Rover is too wide to close in the last three months of the year. The new Mercedes-Benz GLC makes its first appearance in the ranking, causing the outgoing to rack up just 1.187 sales in Q3. With a much improved design from the square GLK-looks that never really caught on, the GLC should be able to fight for a top-5 position in 2016. I don’t think Mercedes-Benz expects anything less from the model. The changeover at Mercedes opens up an opportunity for the Lexus NX to grab 8th place by the end of the year. Also check out the 2015-H1 premium mid-sized SUV segment in the United States. Sales of premium compact SUVs accelerate their downfall, as the Mercedes-Benz GLA is now on the market for more than 1,5 years and two other models are due to be replaced soon. That leaves the Audi Q3 firmly in command, with sales of the facelifted version up 17,5% in Q3 and 9% for the year so far. It improves its share of the segment to over 37%, similar to the share it held in 2013 when there were only 3 players in the segment. The GLA consolidates its second place, but appears unable to grab first place, while the Mini Countryman and Paceman lose 27% of their volume due to intensified competition and because they’re starting to show their age as most of the rest of the Mini line-up has been renewed. Meanwhile, sales of the BMW X1 have come to a virtual halt with only 3.700 units sold in Q3, just a quarter of what it sold in the same period last year. But that’s not very surprising when you keep in mind that the all-new X1 has already been revealed and will arrive in showrooms shortly. 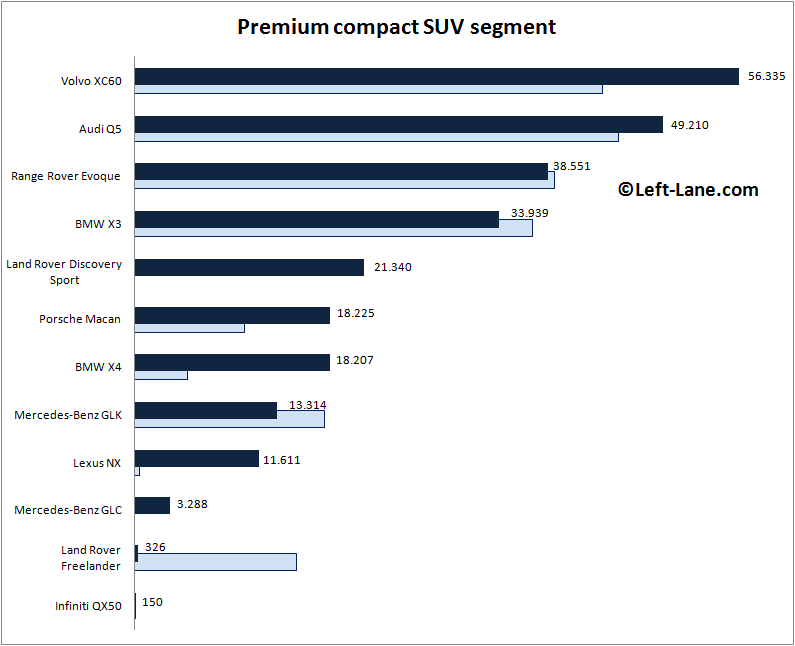 Also check out the 2015-H1 premium compact SUV segment in the United States. Click on any model to see its annual sales from 1997-2014 and monthly sales in 2012, 2013, 2014 and 2015, or use the dropdown menu in the top right of this site. Sources: Manufacturers, ANDC, JATO Dynamics. Lexus can be proud of the NX, the sales are very good in relation to the average performance of Lexus in Europe. Hopefully they can attract new customers with it. I mean, Q3, GLA and X1 have basically the same length of a Qashqai.